Welcome to the Just Home bath remodeling page where you will find information about our preferred contractors as well as listing information for bathroom remodelers in your area. DIY BATHROOM UPDATE TIPS: Remodel a bathroom on a budget with the help of Lowe's "How To" video blog. Established in 2001, we are dedicated to providing quality Bathroom Renovation services at an affordable price. Shower remodeling and door replacement, cabinet installations and remodels, sink and faucet remodels, new tile and flooring installation, and much more! Give us a call to inquire about our new Bathroom Acrylic Liners: Bathroom Remodeling that gives you the luxurious beauty of natural stone in as little as 1-2 days! With Ballesteros Bathrooms & Design, one call does it all. With over two decades of experience, we get the job done right the first time! Wheel Chair Accessible Bathrooms are among our specialties. By hiring only one company for the entire job, we're able to keep our prices low and our customer satisfaction high. Get to know and trust us, no more random people in and out of your home. Kitchen Cabinets Express Inc provides bathroom design to accommodate minor updates, complete remodels, or building brand new bathrooms. Whether you want to build a new residence or add an addition to your home, you can always rely on Advanced Builders & Contractors for truly exceptional service. We have the skill, training and experience necessary to complete your project properly. Call us any time to discuss the many different services we have to offer you. From a simple update to the installation of elaborate fixtures and finishes. Whatever your bathroom design dream may be, California Bath and Kitchen is prepared to complete it. 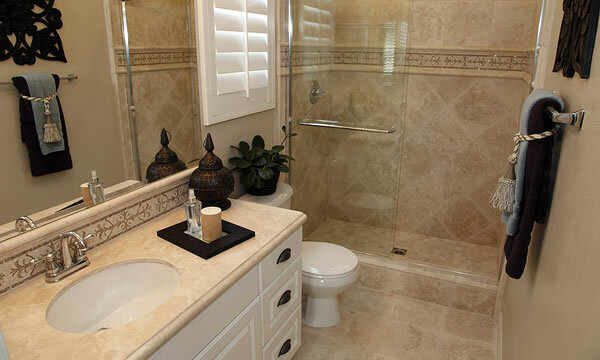 With over 20 years experience and a specialty in tile & stone, bathrooms designed by SF Precision are top quality.